#       else you will get an error: New-WebAppPool : Cannot retrieve the dynamic parameters for the cmdlet. The API has been built with Hypertext Application Language (HAL) to allows APIs to have built-in discoverability. Starting at the root of the API, you can browse the entire API surface. 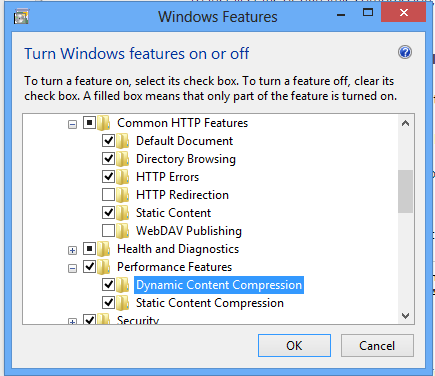 How to enable JSON dynamic HttpCompression (gzip) on IIS in Windows 8. 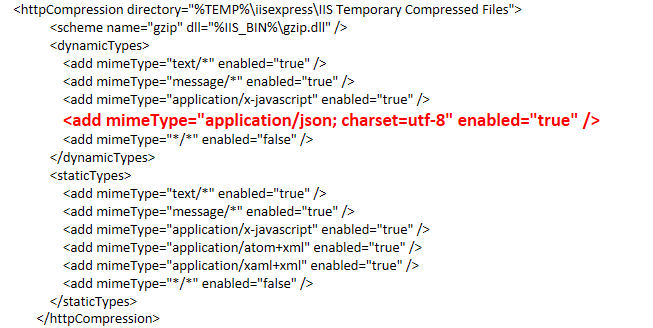 To check if the ISA server is the problem just open a browser on the server en connect to the localhost url, check with fiddler if the dynamic compression works. Shifting to express products like Microsoft IIS Express 8 and Microsoft SQL Server 2012 LocalDb for development. These products are created mainly for development purposes. – Fast and lightweight installation. – Performance improvements for DEV en build server machines. 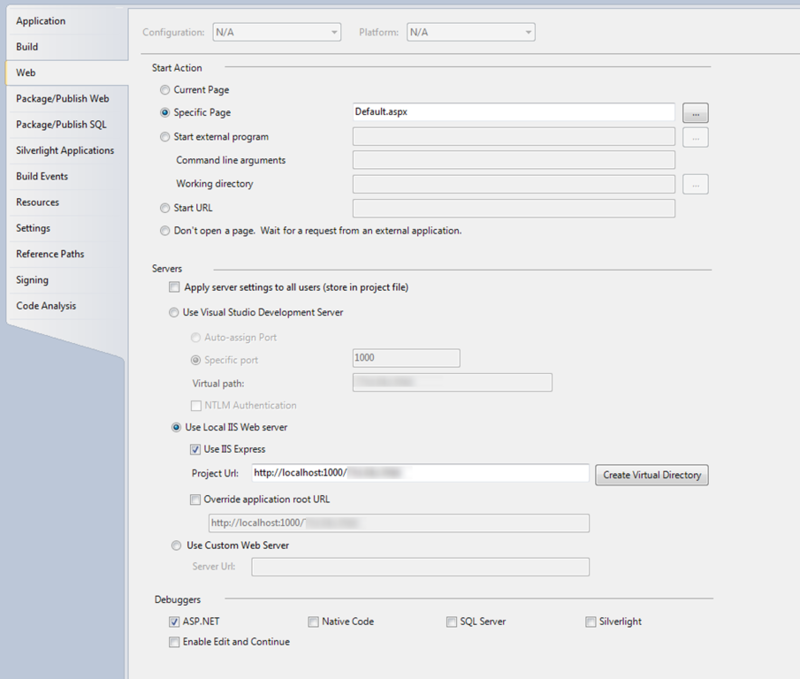 – Build servers can use clean instances to run integration tests. – Easily to restore to new instance. When a per user instance is corrupted it’s very easy to restore it. 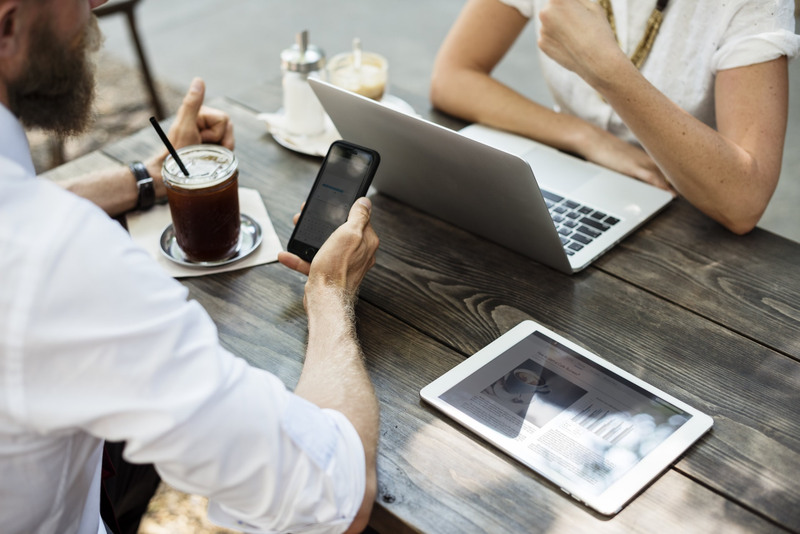 – Multiple users can work on one virtual machine, without interfering with each other. So each developer can change all the things he or she wants to research some new code, without breaking a shared instance of IIS or SQL Server. Of course for the T, the A and P in OTAP, I use the full products. 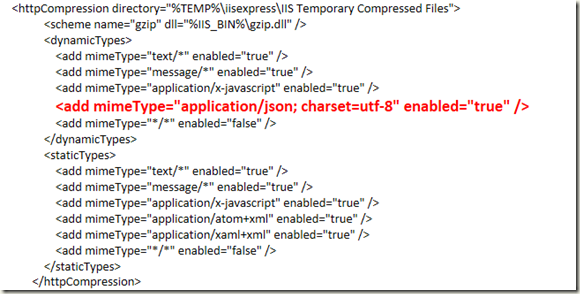 How to dynamically switch between IIS Express and full IIS in Microsoft Visual Studio 2010 by using a csproj.user file. 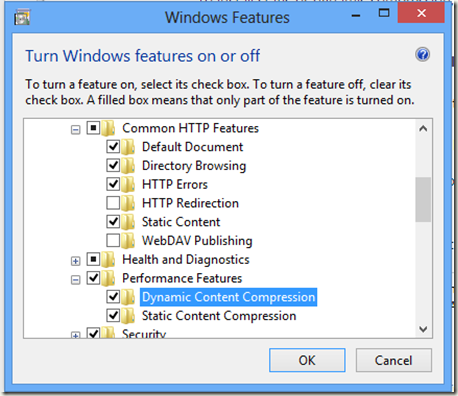 If you want to give every developer the choice to use IIS Express or full IIS during development in Microsoft Visual Studio 2010 sp1, you can use a csproj.user file for you project. This file can be used to overwrite settings in the *.csproj file. This file will by default not be added to TFS, so every developer can use it’s own configuration, without interfering with other developers. 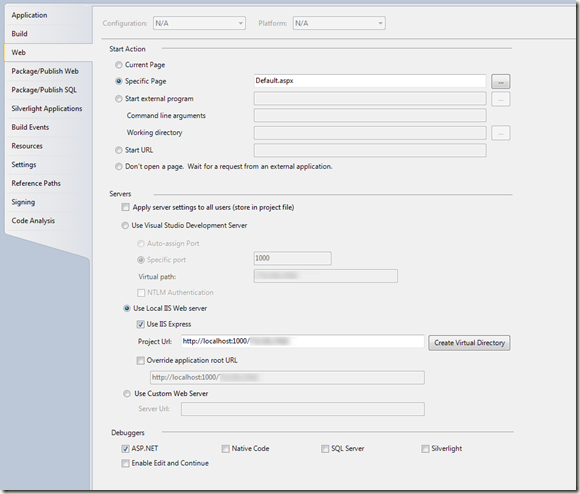 First uncheck "Apply server settings to all users (store in project file)"
Then check "Use IIS Express" on the Web tab from the Microsoft Visual Studio 2010 sp1 project. Now your build server can use the settings in the csproj file and you, as a developer, have the choice to use these settings or overwrite them with the *.csproj.user file. 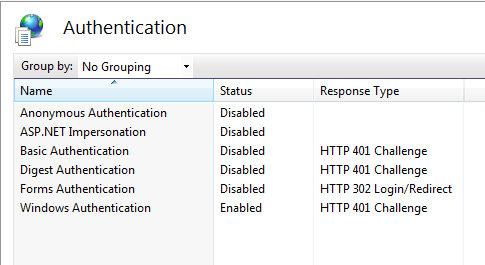 Solving: Windows Authentication fails, when using a host header and accessing IIS on the local box. 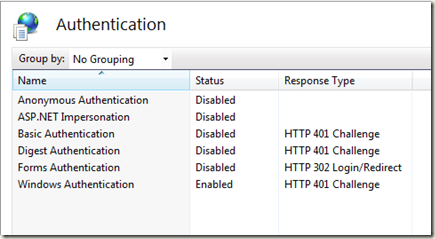 Solving: HttpContext.Current.User.Identity.Name is empty, when using Windows Authentication. If you want to use Windows Authentication in your ASP .NET website, you need to add the <authentication mode="Windows"/> tag in the Web.config. 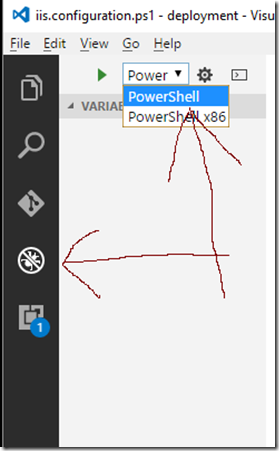 If the HttpContext.Current.user.Identity.Name is still empty. Check the authentication feature of the web application in IIS, make sure all authentication mechanisms are Disabled, except for the Windows Authentication, this should be set to Enabled. After adding the application pool service account to the local administrators group, this error was resolved. Could not load file or assembly ‘App_Web_squ1ikqu, Version=0.0.0.0, Culture=neutral, PublicKeyToken=null’ or one of its dependencies. The system cannot find the file specified. If you have multiple application pools started in IIS 7 and you want to determine which w3wp.exe process to attach the Microsoft Visual Studio 2010 debugger to, you can use the Microsoft Windows Task Manager. Start the Microsoft Windows Task Manager: press [Ctrl + Shift + Esc]. 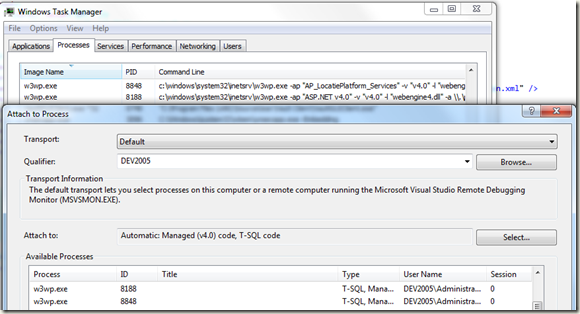 Add the columns "PID" and "Command Line" to the Process tab. The name of the application pool will be shown in the Command Line Column. 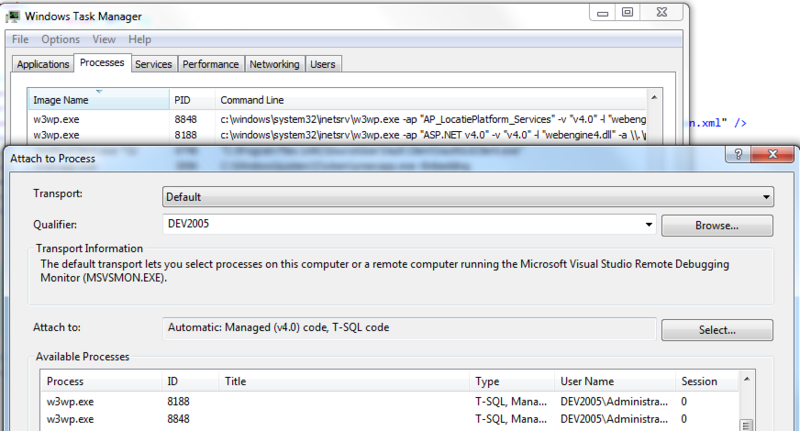 In this case the WCF service I wanted to debug, was running on the default [ASP.NET v4.0] application pool.